Imagine video conferencing that’s easy. No more struggling to connect, searching for the right cable, figuring out why the hardware is not playing nice together, or adjusting the camera so that everyone is included. Picture walking up to the Surface Hub and joining a Skype for Business meeting with a single tap, and sharing content effortlessly. Collaborating with colleagues in the room and across the globe with a simple, intuitive interface. Sound too good to be true? But it’s not. That’s the beauty of the Surface Hub. One device, no fuss, no wasted time. Easy to deploy and manage remotely, the Surface Hub is fitting for large conference rooms all the way down to informal huddle spaces and offices. Anywhere you need to share ideas, video conference with distributed teams or brainstorm on the fly. Want to learn more? Here are 6 key features of the Microsoft Surface Hub. 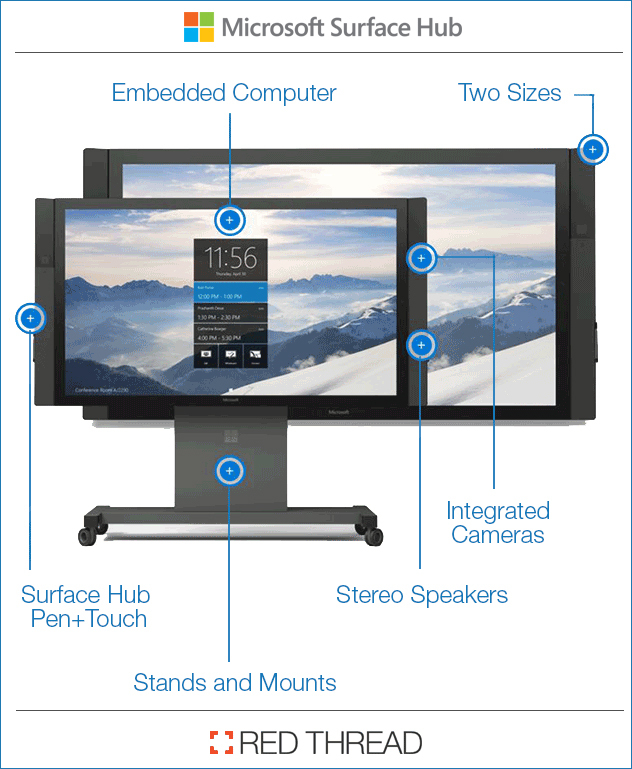 An integrated computer with a 4th generation Intel® Core™ processor powers the Microsoft Surface Hub experience. Microsoft Surface Hub comes with Microsoft Office apps like Word, Excel, and PowerPoint, plus the OneNote whiteboard and Skype for Business. You can choose between 55″HD and 84″ 4K options to fit the needs of different rooms. Built-in dual wide-angle cameras capture people in the room and those working at the device. Remote participants can make eye contact with people in the room. A responsive and natural inking experience that feels as fluid as a pen on paper. Two rechargable pens for inking and annotating rest and recharge right on the device. In addition, advanced touch capabilities recognize up to 100 touch points with precision, allowing multiple people to interact with the screen simultaneously. A variety of stands and wall mounts are available to fit your space. Integrated speakers provide rich sound quality for online meetings or sharing multimedia. What's the deal with coworking spaces?